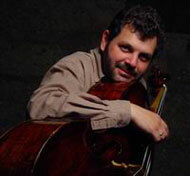 The cellist Balázs Máté (born 1965 in Budapest) is leader of „AURA MUSICALE”. He studied at the B.Bartók Conservatory and the F.Liszt Academy of Music in Budapest. From 1986-92 he was a member of the Hungarian National Philharmonic Orchestra. Post-graduate Baroque cello studies at the Royal Conservatory in The Hague (NL) with Jaap ter Linden, chamber music lessons with Nikolaus Harnoncourt at the Mozarteum Salzburg. Founding member of Concerto armonico Budapest, Trio Cristofori and The Rare Fuits Council. Solo cellist in world famous Baroque orchestras: 1991- Le Concert des Nations (J.Savall), 1994- Wiener Akademie (M.Haselböck), 1996-2005 Les Musiciens du Louvre (M.Minkowski), 2003-2013 Neue Hofkapelle München (Chr.Hammer) etc. He also performs regularly with other ensembles: Concentus Musicus Wien, recreation Graz, Café Zimmermann, Die Freitagsakademie Bern etc. He founded in 1995 his own early music ensemble Aura musicale and in 2002 (with László Paulik, Erzsébet Rácz and Éva Posvanecz) the Quartetto Luigi Tomasini. His debut as a soloist at the Musikverein in Vienna was in October 2000: he performed in the same concert(!) the cello concerto in C-major and the Sinfonia concertante in B-flat major by J.Haydn conducted by Chr. Hogwood. He gave many successful concerts all over Europe, in Brasil, Argentina, Columbia and Japan. Balázs Máté is a well known and highly regarded on the Baroque cello, the violoncello piccolo and the Bass violin. He does important research on undeservedly forgotten composers and their works. He is cello lecturer at the Austrian Baroque Academy and the European Union Baroque Orchestra. From 2010 to 2012 he was professor for Baroque cello of the ”F. Mendelssohn Bartholdy” Academy of Music Leipzig. He held several successful masterclasses a.o. at the UCLA (USA), at the Universities of Cape Town and Stellenbosch (South Africa), Buenos Aires and Córdoba (Argentina) as well as at Ringve (Trondheim, Norway). In 2010 Balázs Máté was given the Liszt Award – the Hungarian state award for musical merits and contributions.